Ager is a huge success every year and pilots often report personal best distance flights. For great XC flying we operate here in the Spring and Autumn. For pure cross country spirit Ager is hard to beat! For the 2018 flying season head to the sunny side of the Pyrenees. We use a very high staff to client ratio and our guides have more guiding experience here than any other operator. Ager is one of the most reliable flying venues in which we operate. You are guaranteed sunshine! (Statistically the Ager valley suffers less than 2 days of precipitation per month. On previous trips over the last 10 years we have always averaged no less than 6 days flying per week! This trip is open to all autonomous pilots qualified to at least CP level. Conditions in the middle of the day can be quite thermic so depending on your level (or feeling on the day) you might choose to wait until later afternoon and evening for a more gentle ride. Temperatures during the day time can be hot (over 30C) Cool down in the pool or get high. Evening temperatures are usually very comfortable. The only time you’re likely to get cold is late in the evening when flying high. Conditions at this time of year are hugely reliable. You are guaranteed sunshine! (Statistically the Ager valley suffers less than 1 day of precipitation during the months of both August and September!) On previous trips we have always averaged at least 6 days flying out of 7! The first thermals of the day start to trickle up the mountain at about 10:30am. Shortly thereafter it is possible to stay up and fly the spectacular scenery all day long. Later in the day thermals can get quite strong (up to 4m/s) but are usually not “head-banging”. (We operate our trips here in late summer for a reason) Later still, the air starts to calm and the ridges become soarable. Then in the evening, the famous restitution bubbles up from the valley floor rendering the Ager skies flyable well through to sunset and beyond. Typically, at this time of day the whole valley goes “magic” with smooth gentle lift to be found all over the place: restitution – a special experience for any pilot. 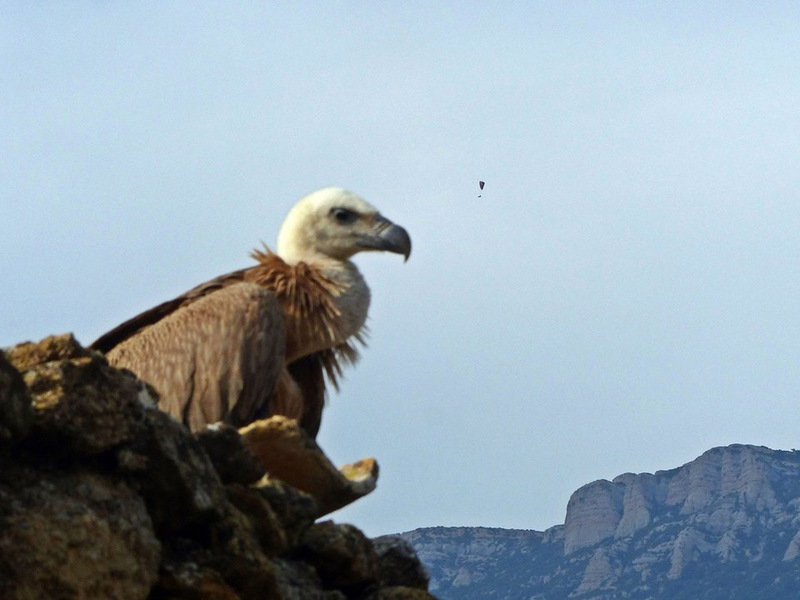 Ager’s flying is very spacious, though the there are few hundred local vultures make great thermal markers. 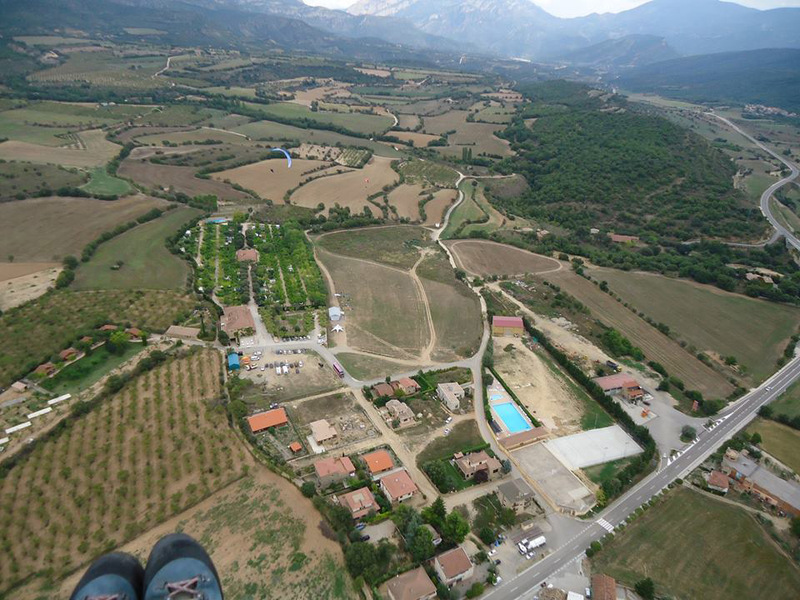 The main Ager flying arena was carefully constructed millions of year ago ostensibly with paragliders in mind. Orientated east-west, the main valley provides us with many safe landing options. It’s no coincidence that Ager has been home to probably more big competitions than just about anywhere. It’s the large launch and landing coupled with the hugely reliable flying conditions. 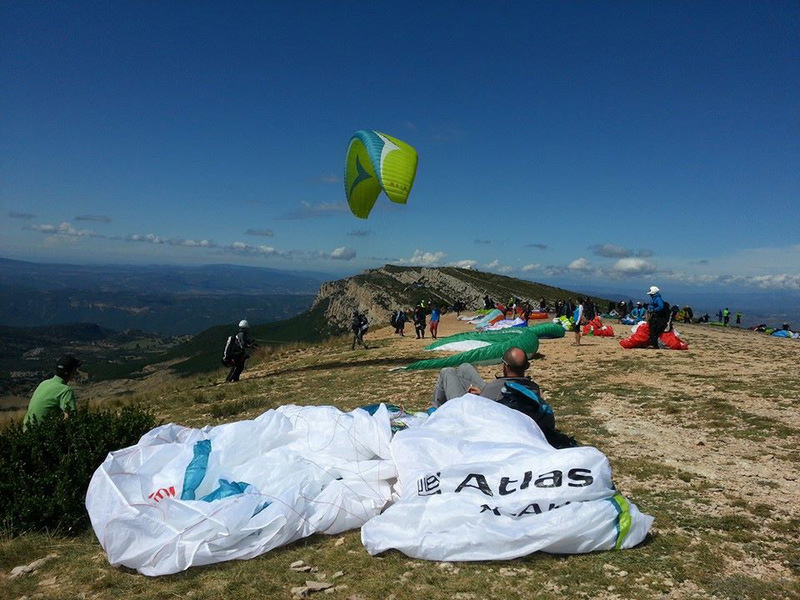 The main Montsec mountain range is South-facing with four main easily accessible launch sites, providing perfect flying opportunities for all pilot levels throughout the day. 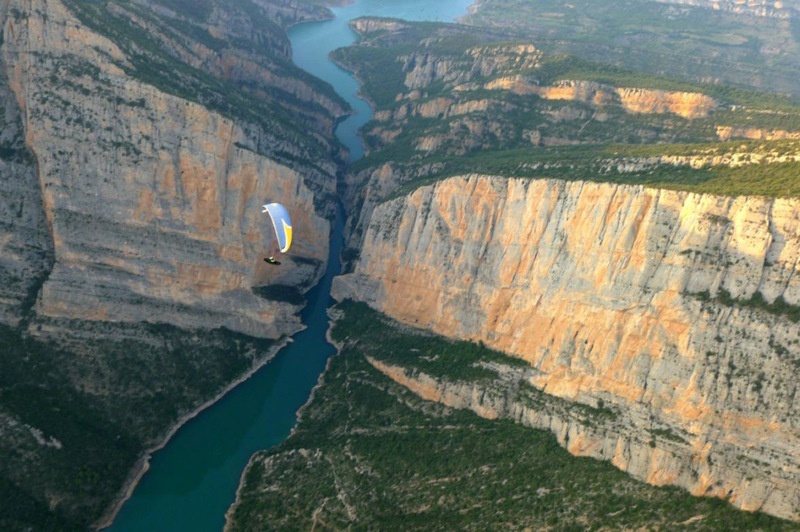 Although a Mountain flying venue, the large valleys also work very well and offer a flat-land flying element to this destination. The main Ager landing area is perfect. Not only is it the biggest landing area I’ve ever seen it also happens to be right next to the bar, the pool and our accommodation, offering immediate options for the all important “après-vol” experience. The main Mountain chain is some 20km long and separated into upper and lower tiers. Two of the mains launch sites, “Coll d’Ares” and “la Pedra” are located on the upper tier with the other two, namely “Raudoral”, and “Gabrielo” situated on the lower second tier. This gives us some obvious flying advantages. Upper launches (the launch we tend to use most often) are separated from the landing zone by 900m (3,000ft+) of height difference. This unusual topography means that if you miss lift on the first level you get a second chance to hook a thermal on the second tier. The two tier mountain also means that if the top gets too strong to launch we have some very favourable launch options lower down the mountain. Arrival: We meet you at Barcelona Airport usually in the afternoon. Fly as much as possible! Our daily plan through the week will of course depend on the flying forecast, but typically we’ll meet up in the morning at about 9am. Lower airtimers are sometimes keen to grab an “easy” morning flights. Others will prefer to wait for the thermals to kick in. Mid morning we’ll travel up to launch to get ready for the main XC flight of the day. Our XC flights are often task-focussed giving pilots of all levels something to aim for. The afternoon is busy with flying and retrieves, but our high staff to client ratio means that we can often manage two XC flights per day. We generally meet up again in the early evening and set off up the mountain again for a couple of hours of sunset soaring with the vultures. We are operating free airport pick-up from Barcelona airport for flights arriving by 2:30pm at the latest. Also included is our airport drop-off on the morning at the end of the week. (Thursday pick up and drop off) Return flights should leave after 12noon. There are a multitude of cheap flight operators flying from airports all over the UK and elsewhere. IMPORTANT: Please make sure you book flights for Barcelona (NOT Girona or Reus) and that they are arriving in time for your FREE transfer to Ager. Please wait until your trip with us has been confirmed before booking your flights. We usually meet up at Terminal2. We’ll email you a few days before your trip starts to let you know exact meet-up arrangements. 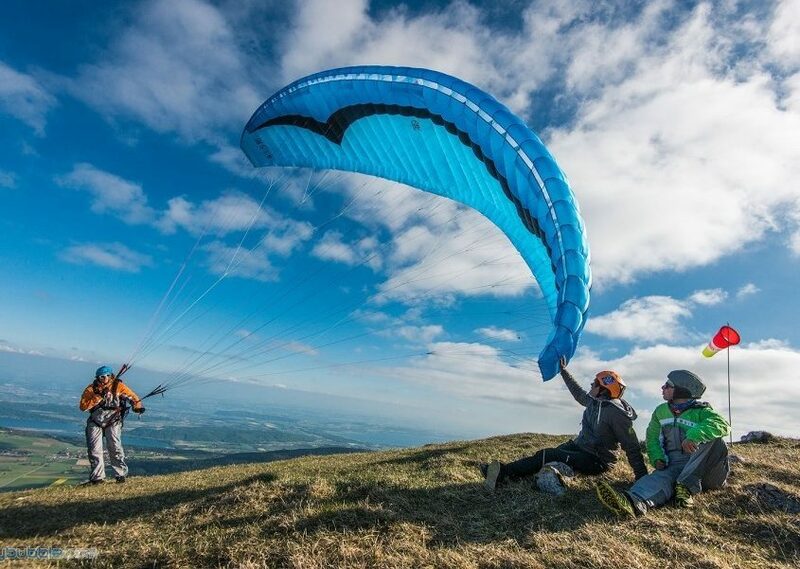 Paragliding insurance (essential if you want to fly!) Bring insurance documents with you!! Certified harness with fitted and recently re-packed reserve parachute. Sunscreen – It will probably be hot and sunny during the day! Sun-glasses – It will probably be hot and sunny during the day! Hat – It will probably be hot and sunny during the day! Summer clothing – It will probably be hot and sunny during the day! Warm clothing for flying. It can occasionally get quite chilly in the evenings. Bedding and towels are provided in the bungalow accommodation. Ground handle, ground handle, ground handle! The top pilots in the world spend hours every month playing with their wings…on the ground! The happier you are with your ground handling, the better you will understand your wing (e.g. pitch, roll, yaw and pressure control), the safer will be your launches, the safer will be your landings and the safer you will be in the air. Those good at ground handling also tend to spend less time “stuffing up” their launches and so tend to spend more time in the air. They also tend to be the more confident on launch and can therefore concentrate on the flying!! To maximise your safety and the safety of those in your proximity (! ), to maximise your enjoyment – ground handle ground handle and then ground handle!!! We require you to have insurance . Please make sure your bring your insurance documents with you. Ager is the ideal place to gain your “Pilot” or “Advanced Pilot” rating. Please ask well in advance if you are interested in completing tasks or sitting your exam. We will often use downtime, usually in the morning to go discuss flying topics of interest to budding XC pilots. The bungalows are self-catering, and there is a small shop in the village of Ager to stock up with the essentials. Many pilots like to eat out. There are 4 restaurants to choose from. 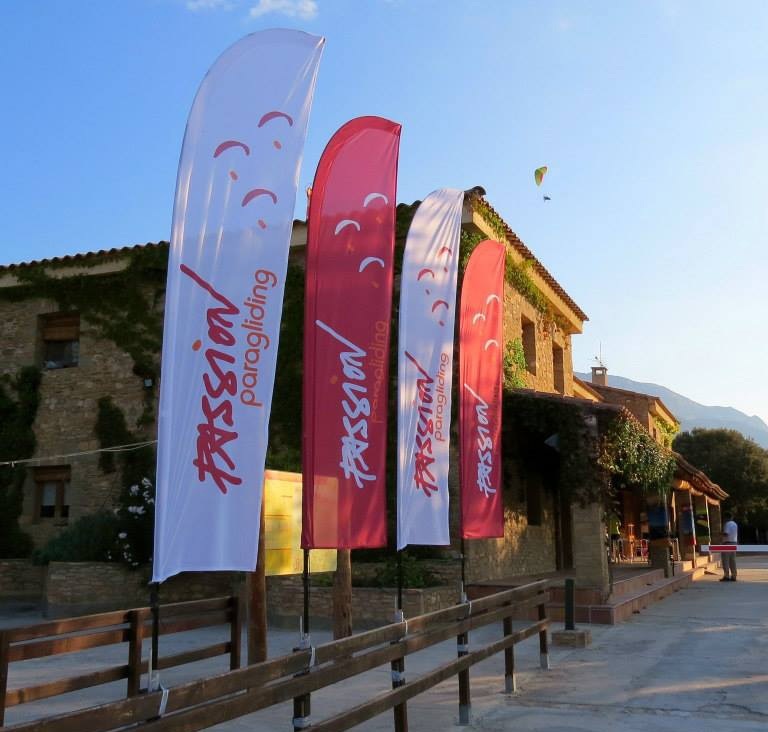 The local camp-site is the most convenient, but others in the village are equally attractive, offering a tasty selection of local specialities. The camp-site to which our bungalows belong has wifi and an outdoor swimming pool, free to our clients. Safety is our absolute priority. We continually assess flying conditions in our passionate endeavour to keep you as safe as possible. However, please understand that although we will do all we can to ensure your safety, you should know your own level of ability and as a qualified pilot when it comes to flying understand that it is your decision to fly, and yours alone! A basic first aid kit will be kept in the vehicle at all times. Emergency rescue facilities in the area are excellent. We are the best value guiding operation in Ager. We are the most experienced pilots and guides. We understand the local weather here better than anyone. We have been operating in Ager for longer than any other operation. We have more personal XC experience by far than any other operation so can help you go further than anyone else. We fly with you. We are not here to simply drive you up the hill and chuck you off. We fly with you, hunting out thermals for you, testing the air for you and giving you the highest quality air-to-air radio assisted guiding possible. We are certainly not drivers posing as guides. Our clients fly more. Time and time again when operating in Ager we have proved that we can find you more of the good stuff than anyone else. Its our number one priority! We use dedicated retrieve drivers (two of them!). They are not acting as guides in the air. They are dedicated to retrieving you – which means a lot less waiting around on the ground for you. Unlike other operations there is no limit to the number of times that we are prepared to take you back up to launch. Book with us if you don’t want to miss out on what could be the flight of the week. We insist on flying in Ager only at the best time of year. We don’t fly here in the summer: its too hot for comfort and the Alps are way better in the summer anyway. Nor do we extend our season into October when you might be lucky, but might not be! 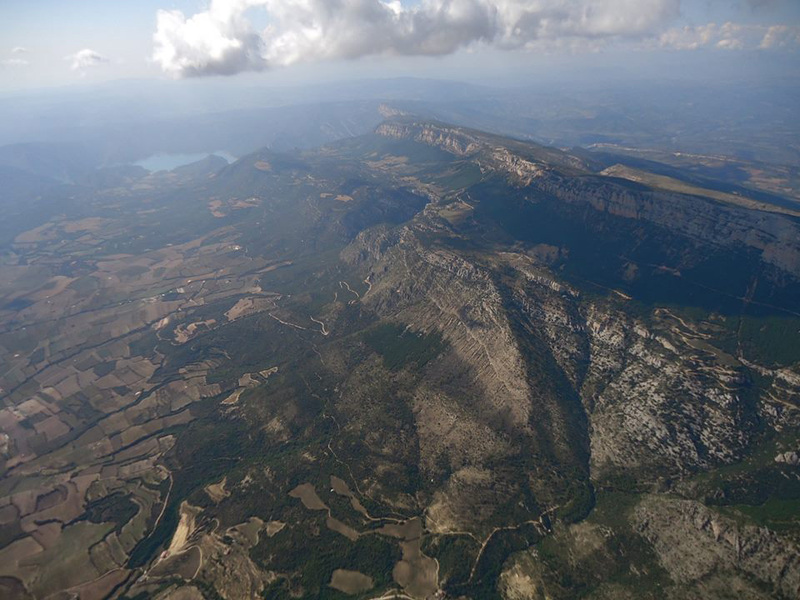 We have studied all available meteorological and recorded paragliding flight data on this location and together with our experience we know that we are operating here at the very best time of year for reliable and safe flying. We have the highest ratio of staff to clients. We know your holiday time is precious and we want to look after you properly. We use live tracking to keep an eye on you. It’s an extra safety feature, but also helps us guide you better and retrieve you more quickly. We have the best accommodation. Unlike other operations we do not cram you in to the accommodation. Not only is our accommodation better placed than any of the alternatives, but in bungalows designed for 4 we NEVER allocate more than 2 pilots which means you get to spread out and relax. Guiding comes in many forms, from the simple (“There’s the take-off. Hope to see you later!”), through to the superior air-to-air radio assisted guiding. Whilst we believe there is room for most types of guiding, Passion opts to give you the highest quality service. We have considerably more experience of this area than any other operator. We live here all year round! We aim to give you the very best service and flying experience with your safety as our absolute priority. We’ll have an excellent staff to pilot ratio with at least two guides and two retrieve drivers per group!! In addition to daily weather briefings and full site briefings, we will also be offering task-focused flight plans to suit every ability level. To help keep you in the air as long as possible (if that’s what you want!) we will also be flying with you to give you in air tips and pointers to maximise your flying experience. We believe that it is very important that your guide flies with you – to help you understand the air and get the most from your flight. This is your holiday. Get the most out of it: ask as many flying-related questions as you like. We are here to help. Don’t settle for “cheapo” flying. You spent a lot of money on your training and on your equipment. You’ll spend money on flights to Barcelona. It makes sense not to scrimp on what matters most – the flying! Stay safe, never stop learning and don’t miss out on the fantastic flying Ager has to offer! Discover in more detail how live-tracking not only keeps you safer, but helps us help you.